Good evening. Thank you Professor Tremonti for the kind introduction. I have actually had the pleasure of meeting Professor Tremonti before, and as I’m sure you all know, he is a very perceptive observer of Italian and world affairs. I am honored to be on stage with him. He is the professor, and I am just the student. It’s a pleasure to speak with you tonight about economic relations between the United States and Italy. I have been living in Italy, the bel paese, for six months now, and so in many respects, I am in a steep learning curve. I am excited by all that is involved in being the U.S. Ambassador to Italy. There are so many rewards, and so many challenges. As I have traveled across Italy, I am always so amazed, not just by Italy’s food and beauty, but also by its people. I must admit that I have been impressed by the warmth and receptivity of the Italian men and women I have met. U.S. firms’ affiliates in Italy employed over 220,000 people in 2015, and I am sure it is up even more now, whereas Italian affiliates in the U.S. employed over 130,000 people. We can point to great U.S. companies investing in Italy, particularly in the South. In 2016, Apple opened up an app development training center for university students in Naples, its first in Europe. In 2017, Deloitte Digital opened up an “Innovation Academy” for students in Naples as well. In Puglia, Boeing makes 14% of the parts for its 787 Dreamliner, and its activities support about 10,000 jobs in Italy, mostly in the South. Italian Foreign Direct Investment, or “FDI,” in the United States continues to climb: In 2016 Italian FDI in the United States reached $30 billion, whereas U.S. FDI in Italy totaled $24.7 billion. Fincantieri has doubled the number of jobs at a Wisconsin-based shipbuilding company since initially investing there in 2009. Enel has recently become the largest wind energy operator in Oklahoma after investments in two wind farms. Pelliconi’s recent investment in a manufacturing center in Orlando has positioned it to break into new markets. 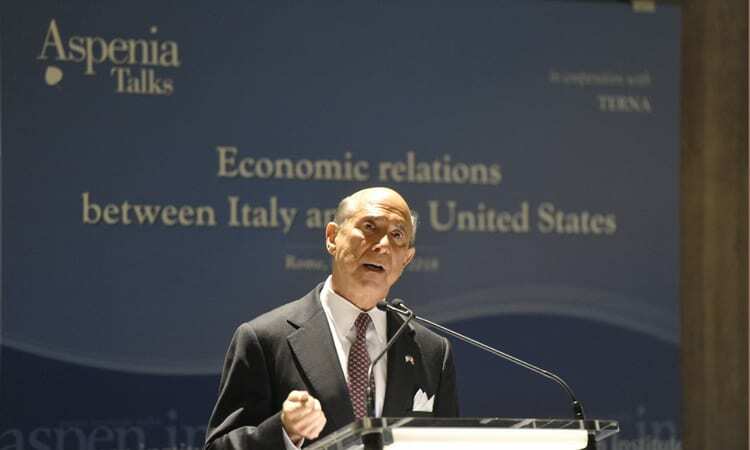 The United States is a great market for Italian investment. Some of the recent developments, like improving the tax system, are making it even better for businesses. It is also easy to do business in the United States. We have a fast, predictable judicial system and a robust financial system. We have a huge consumer market (over 325 million consumers). I know most of you are familiar with it, but I want to mention the Embassy’s Select USA program. Through this program, the Embassy can provide very useful, individually-targeted information to Italian firms interested in investing in the U.S. market. In fact, we have upcoming programs in Turin, Verona, and Florence where 17 American states will meet with potential investors. As you know, promoting U.S. exports is a top priority for the current administration. You have heard our President and others speak to that point on a regular basis. But I should share that I am comfortable that we will pursue free, fair, and reciprocal trade and overall economic relationships that are in both our mutual interest. U.S. imports of Italian goods rose to $50.0 billion in 2017, a 10.4% increase, while Italian imports of U.S. goods rose to $18.0 billion, approximately a 10% increase. In 2017, Italy had a trade surplus of almost $32 billion with the United States. With growth here resuming, and it seems to be clear now that we are really moving forward, I am hopeful and believe that U.S. exporters will see more opportunities in Italy than ever before. For example, Italian consumers appreciate high-quality produce, potentially making Italy a very attractive market for U.S. farmers. But, U.S. exporters tell us that the EU’s required certificates are so complex and burdensome that it is very hard to even figure out the certification requirements. Anything we can do to ease that process will help both U.S. farmers and Italian consumers. Also, digital solutions exported to Italy by U.S. companies are helping Italian manufacturers increase productivity and become more competitive internationally. With regards to China’s continued use of unfair trade practices, the United States will work with our allies to oppose excess capacity, market-distorting subsidies, and forced technology transfer. Energy diversification is another important area. Enhancing European energy security by ensuring access to affordable, reliable, diverse, and secure supplies of energy is fundamental to national security. Italy’s Trans-Adriatic Pipeline (TAP), which aims to bring gas from Azerbaijan, is one way to enhance security. Recent gas discoveries in the eastern Mediterranean are another. New and cheap LNG from the United States – which is set to become one of the world’s leading gas producers in coming years – is also a major opportunity to pursue those energy security goals together. Italy will be going to the polls in March, and we will look forward to working with the next government to continue reforms, increase U.S. trade, and promote investment — whatever the outcome. In conclusion, we should continue to work together in a true partnership where we are each helping the other to the fullest extent possible, and growing the pie for people in both our countries. Thank you for inviting me to speak with you tonight.